Having a pet, as our parents kept telling us when we were younger, is a great responsibility. Now we know the magnitude of it. The pets have to be exercised, washed and fed. All these take time. It’s time you might or might not have. It's time that you’ll probably want to spend doing other things. Having a device that can help you take care of your pet is something that’s welcome. Mercifully, there is such a device, it’s an automatic pet feeder. With this, you’ll be able to have your cat fed throughout the day, without you needing to be in constant supervision of the work. All you do is feed the hopper and let the device do the rest. It’ll constantly fill the feeding bowl, allowing your pet to get its food whenever it’s hungry. It all sounds exciting but before you run off to get yourself one, there are a few things you need to take into consideration. 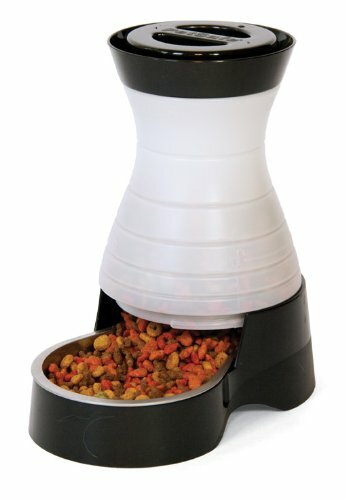 What features make the best automatic cat feeders? There are different kinds of automatic feeders. There are those that require electricity or battery power to work and there are those that take advantage of gravity. The electric ones have timers that are set to allow the feeder to automatically release food into the bowl and sound an alert to let your pet know that it’s feeding time. Of course, these cost more. The non-electric will simply allow food to slide through the tube when the bowl is empty. Also, get to know the capacity of the hopper, the container where food is stored. There are smaller hoppers that get depleted faster so if you have just one pet like a cat, this will do. If you own multiple pets then a bigger capacity hopper would be ideal. Okay, to help you sift through the piles of feeders in the market, we have compiled a list of five of the best. Kicking our review off is the Pet Café Feeder from Petmate Company. This is a reliable, well-built automatic feeder for your cat. However, the feeder doesn’t discriminate. If you have a small dog, the Petmate will serve it as well. You have three color options to choose from. There’s the Pearl Tan, Pearl Waterfall and the Pearl white. That’s where the difference ends. All other features of the Pet Café are similar. The Petmate has a food storage bottle that holds your pet’s snacks and releases automatically through a chute that’s underneath. The food then safely lands on the attached plate. It works with the assistance of gravity, no gears required. The food storage hopper can hold up to 6 pounds of food making it unnecessary to keep refilling it. The lid at the top is removable for when you do need to get it refilled. But it doesn’t just dispense food. 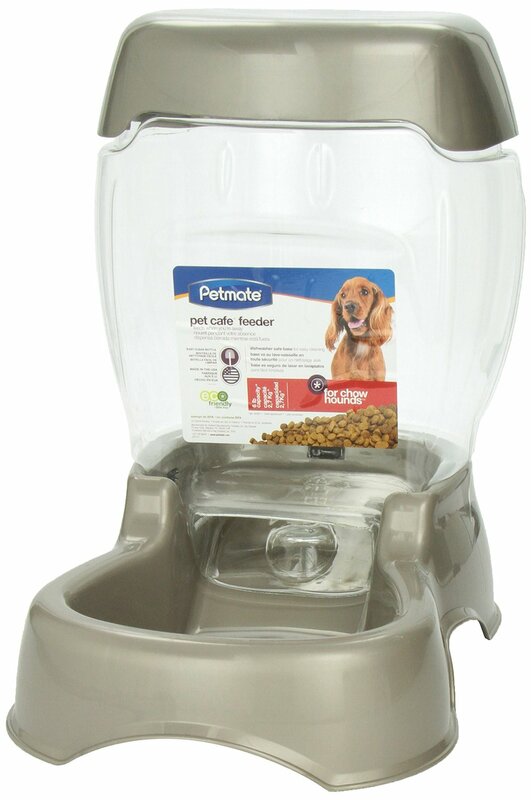 It can also hold and dispense water for your pets making it a highly versatile feeder. The Pet Café is made of an environmentally sustainable PET bottle. The lid and base, on the other hand, are made of a dishwasher safe material. To enhance portability, the feeder has easy-grab handles on the base. And weighing in at just 1.2 pounds, moving it around is a breeze. Pet Safe isn't left behind as they present to us this lovely looking and highly functional Feeder. They call it a dog and cat food station and that’s exactly why it’s a fan favorite. Being able to feed all your pets at one station is a lot more convenient than needing different feeders for your different pets. This is a highly portable feeder that measures in at 9.8 inches by 6.5 inches by a height of 10.5 inches. It can hold a maximum of 2 pounds of dry pet food, just the right amount to keep your little friends fed for a long time. The bowl, sitting underneath the hopper is made of stainless steel. This makes it extremely durable, great for use with pets. It is also easy to clean. Simply throw it in the dishwasher and let the machine do the cleaning for you. The hopper, on the other hand, towers above the bowl at a height of about 11 inches. It holds the food and releases it with the help of a gravity system. This hopper is made of a durable plastic. This is a BPA-free plastic meaning the food your pet will feed on is free of any contaminants. Also, the hopper easily detaches from the rest and when attached, it securely locks in place. Trixie comes in next with this adorable little pet feeder. This is a product that does two things at once; feeds your pet and keeps the cat active, helping expend excess energy. Sitting at the top is a tiny bowl, a container with a lid. Fill this container up with your pet’s small treats and the snacks slide down through the six different tunnels below. The cat can then reach for the food, enjoying itself in the process. But you can adjust how quickly the food is released. If you want to use the Trixie as a feeder, you can make the food slide down faster. 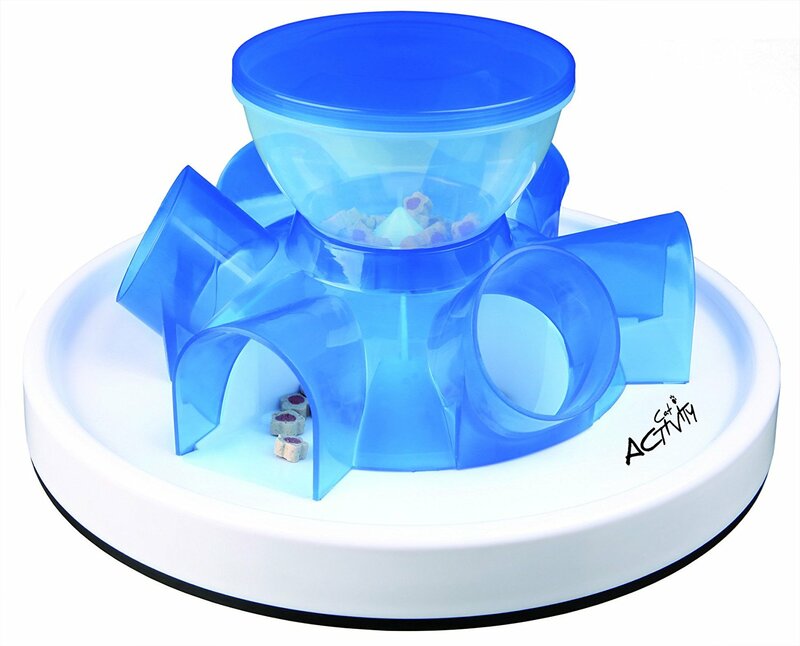 Made of plastic, the feeder is durable enough to withstand the bustle of pet feeding. It is, however, quite lightweight making it easy to move around within the house. Having a flat base, the feeder sits quite stable on the floor, preventing any accidents. And to clean the feeder, simply throw it in the dishwasher as the build is dishwasher safe. Pet Safe is at it again. This time, they bring to us the Simply Feed Automatic Feeder. This one deviates from the standard feeders already reviewed above. It’s more state of the art, powered by batteries or electricity, via the mains socket. And the result of this is that the feeder takes on a mind of its own. At the top of the feeder, there’s an LCD display and right next to it are control buttons. At the top, there’s a locking lid which when opened grants access to the food hopper. Because of this locking lid, your pet won’t be able to access the food from the top but only the food that lands on the stainless steel bowl below. The Simply Feed has a digital timer that’s programmable to 12 meals a day for your pet. The meals can be apportioned from an eighth of a cup to four cups. 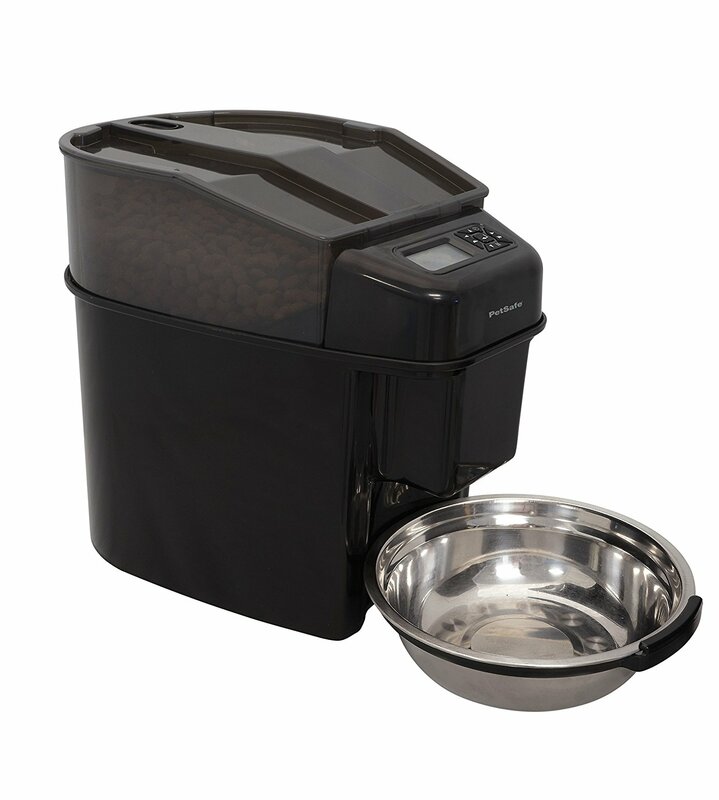 Thanks to the conveyor within, the feeder will automatically dispense the food onto the bowl at the specified times, feeding your pet throughout the day. With the slow feed mode, you the Feeder can dispense meals that are more than an eighth of a cup, allowing your pet to eat slowly. The immediate feed mode releases the food instantly. 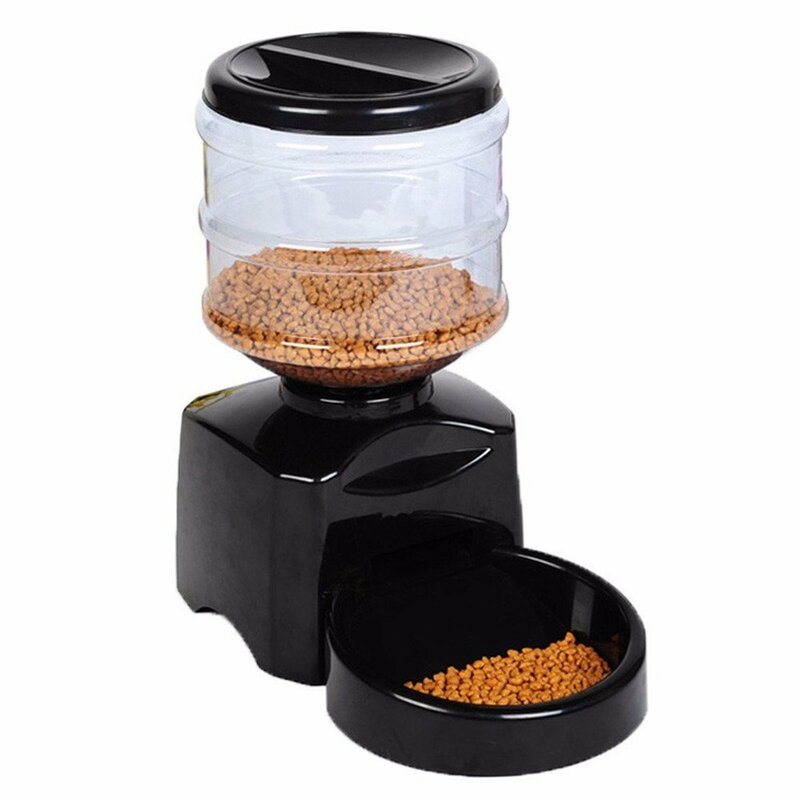 Last but not least, we have the Fitiger automatic feeder, a feeder cats or dogs that is electrically powered. This is a beautifully crafted device that is designed to ease the feeding process for your pets. And since it is electrically powered, we expect this to be effortless. The food hopper sits above and has a diameter of 18 centimeters and a height of 21 centimeters. This hopper can hold up to 5 liters of dry food. The base has a height of 16 centimeters and on it, there’s an LCD display that shows the set times for feeding. The bowl has a diameter of 19 centimeters and it securely attaches to the base, receiving food that slides through. Fitiger makes it extremely easy for you to feed your pet by allowing you to not only set the appropriate time for feeding but to also record your voice in a ten-second message so that when it’s time for feeding, your pet will hear your voice. The whole idea of having an automatic pet feeder is because of the reliability and the convenience. With a proper feeder, you can ensure that your pets are well fed throughout the day, even if you’re not home. And all the above feeders perform their assigned tasks with zeal, ensuring your pets are well fed throughout. You’re looking for a reliable feeder that doesn’t burn a hole in your pocket. You’re looking for simplicity and convenience all wrapped in one. There is one such feeder on our list and it’s time to crown it as the best. It’s the Petmate Pet Café Feeder. It edges past its counterpart because it’s an affordable automatic feeder with a capacity of a whopping 6 pounds of food, more than half of the others. Using just gravity to push down the treats, the Petmate takes simplicity to a whole other level. And the best part is, you can use it to supply your pets with water as well. The Pet Café takes the crown. Thank you very much! We appreciate the feedback!